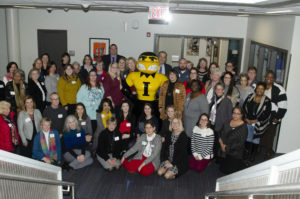 IWF friends and supporters met to celebrate with 2019 Grantee Partners at the Annual Check Presentation. Grantees shared their programs with the group, and friends and supporters got to meet and visit with representatives from each organization. Grantmaking is one of five key strategies the IWF uses to support women and girls across the state. Working together with great support from our volunteers, donors and sponsors, IWF was thrilled to be able to grant $100,000 for programs working to shatter the barriers of employment, child care, education/training, housing, transportation and mentoring across the state. To date, IWF has awarded over $860,000 to more than 200 programs benefiting women and girls in all 99 Iowa counties. As IWF celebrates its 25th anniversary, we hope to shatter the $1 million mark in grantmaking this year. Please consider a donation and help us have an even larger impact as together we are indeed stronger.